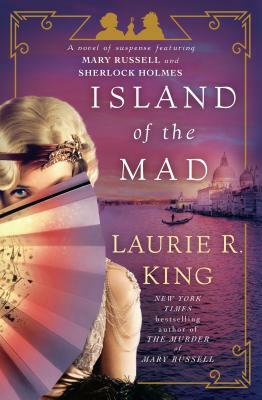 Laurie R. King’s New York Times bestselling series featuring Mary Russell and Sherlock Holmes is “the most sustained feat of imagination in mystery fiction today” (Lee Child)! The last thing Mary Russell and her husband, Sherlock Holmes, need is to help an old friend with her mad, missing aunt. Lady Vivian Beaconsfield has spent most of her adult life in one asylum after another, since the loss of her brother and father in the Great War. Although her mental state seemed to be improving, she’s now disappeared after an outing from Bethlem Royal Hospital . . . better known as Bedlam. Russell wants nothing to do with the case—but she can’t say no. To track down the vanished woman, she must use her deductive instincts and talent for subterfuge—and enlist her husband’s legendary prowess. Together, the two travel from the grim confines of Bedlam to the murky canals of Venice—only to find the shadow of Benito Mussolini darkening the fate of a city, an era, and a tormented English lady of privilege. Laurie R. King is the New York Times bestselling author of fifteen Mary Russell mysteries, five contemporary novels featuring Kate Martinelli, the Stuyvesant & Grey novels Touchstone and The Bones of Paris, and the acclaimed standalones Lockdown, A Darker Place, Folly, Califia’s Daughters (written under the pen name Leigh Richards), and Keeping Watch. She lives on California’s Central Coast.